The Arboretum Library has a Rare Book Room of about 500 volumes. The oldest book is an herbal from 1598. The Rare Book Room contains a variety of materials with exquisite botanical illustrations, historic botany and horticulture books from the 1500s to the 1800s, and unique items from the history of the Arboretum and Southern California gardening. The plants portrayed in the images are native to Mediterranean Climate Areas and many of them can be found in the Arboretum. Please remember that the location of a plant sometimes changes. If you want to look at the complete source, you can see digitized copies on Internet Archive or click on the link beside each source. The hand-colored engravings and lithographs from Paxton’s Magazine of Botany and Register of Flowering Plants claim their honored place as highlights of Victorian botanical illustration. As the nineteenth century ushered in a profound era of plant hunting and gathering worldwide, newly discovered botanical specimens were brought to Europe for cultivation. Sir Joseph Paxton (1801- 1865) endeavored to include these fine discoveries as part of his floricultural monthly; The Magazine of Botany and Register of Flowering Plants, which also featured the favored British cultivars. Joseph Paxton was, at one time, superintendent of the gardens at Chatsworth House, owned by the Sixth Duke of Devonshire. In addition to horticulture, Sir Paxton’s talents extended to Victorian garden design and architecture, which was evidenced by the creation of the Crystal Palace for the Exposition of 1851. An immense iron and glass structure, the Crystal Palace was the unparalleled showcase of Victorian innovation and design, the inspiration for which was Paxton’s own Lily House at Chatsworth, where he displayed his prized Water Lilies. Paxton’s design and creation of the Crystal Palace was a monumental achievement, for which he was knighted. 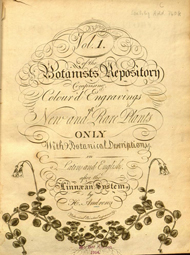 There are a few famous examples of seldom seen botanical periodicals. The orchid plates published in journals like Curtis’s Botanical Magazine and Edwards’s Botanical Register have been reprinted, but many others are known only from the originals locked away in libraries. 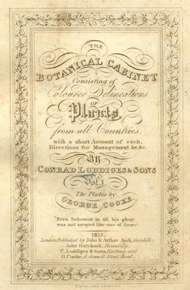 A good example is Loddiges’ Botanical Cabinet, published in 20 volumes with 2000 plates between 1817 and 1833. 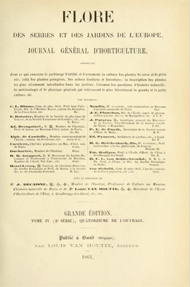 Flore des Serres et des Jardins de l’Europe (‘Flowers of the Greenhouses and Gardens of Europe’, 1845-1888) was one of the finest horticulture journals produced in Europe during the 19th century, spanning 23 volumes and over 2,000 colored plates with French, German, and English text. Founded by Louis van Houtte and edited together with Charles Antoine Lemaire and professor Scheidweiler, it was a showcase for lavish hand-finished engravings and lithographs depicting and describing botanical curiosities and treasures from around the world. The work is remarkable for the level of color-printing craftsmanship displayed by the Belgian lithographers Severeyns, Stroobant, and De Pannemaker. Louis-Constantin Stroobant (1814-1872) printed many of the illustrations for the first 10 volumes. During his career, De Pannemaeker produced some 3,000 illustrations for botanical periodicals and books and was also a noted landscape painter. Most of the plants depicted in “Flore des Serres” were available for sale in van Houtte’s nursery, so in a sense the journal doubled as a catalogue. If you have any questions about the Rare Book Collections of The Arboretum Library, please don’t hesitate to ask librarian Susan Eubank.